Today, fitness and physical health are at the forefront of many Americans' minds. We've seen a shift back to the days where fresh, organic milk can be delivered to your doorstep and everyone prefers locally-grown veggies. This health craze has spurred a movement in the bridal world as well. We love all brides just the way they are but for those who want to slim down, tone up, reduce stress or simply feel their absolute best on their wedding day, we can't wait to share these resources we've found! Pure Barre: Full body barre workouts have taken over the fitness scene because they engage your entire body through a low-impact technique proven to show results. Don't worry, you don't have to be a ballerina to be a rockstar when it comes to barre classes. Where? With locations in Alexandria, Arlington, Dupont Circle, and National Cathedral the possibilities are endless. The Deal? "BRIDES: Commit to Fit" is a three month membership of unlimited classes for $450. Fuse Pilates: They take personal requests tailored to your dress! What are you most excited about showing off? Your back? Your arms? Where? Dupont Circle: 2008 Hillyer Place NW Washington, DC 20009 & 1401n 14th Street NW Washington, DC 20005. The Deal? A 6 month unlimited class special for brides-to-be. Brides Run: Wedding 5K Fun Run and Walk created to help brides relieve the stress that comes along with planning a wedding as well as meet other brides in the area. Where? The runs are offered in various locations across the U.S. including Washington DC, Chicago, and St. Louis. The Deal? This run can be for just brides and future husbands or brides can bring their entire wedding party along! Registration is $30 per person. The Bar Method: Bar classes are known for small movements that tone and stretch your entire body. This low-impact exercise will show quick results for brides who want to look and feel great. Where? Located in DC at 750 9th Street NW Washington, DC 20001 as well as a location in Bethesda, MD. The Deal? 3 months of unlimited classes for $550 with added advantages such as a pair of free Barre Method socks, the possibility to freeze your account at any time, and a private bachelorette party. Zen Bride Yoga: What could be more stress relieving than yoga? 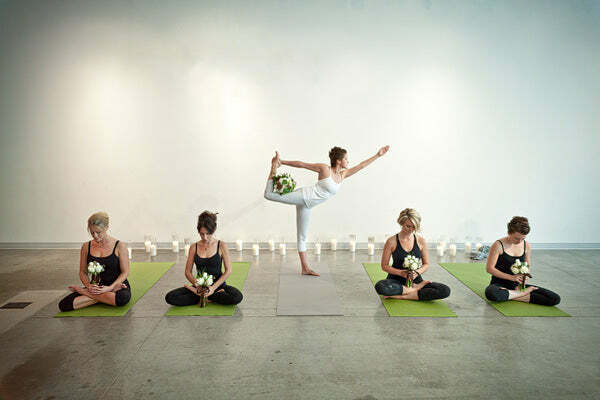 Zen Bride Yoga offers custom designed yoga at the bride's request. Where? Charlottesville, Virginia. The Deal? Custom yoga packages begin at $250 and typically include wedding day yoga for the bride and bridal party, 4-6 weeks of private yoga classes for the bride, a yoga bachelorette party, and bridal shower yoga. Pure Barre: Full body barre workouts have taken over the fitness scene because they engage your entire body through a low-impact technique proven to show results. Don't worry, you don't have to be a ballerina to be a rockstar when it comes to barre classes. Where? In addition to the DC Metro locations above, Pure Barre is also located in Charlottesville, Virginia. The Deal? "BRIDES: Commit to Fit" is a three month membership of unlimited classes for $450. Exhale Bridal Bootcamp: Includes group classes, facials, and weekly check-ins to keep brides healthy and active! Where? Locations all over the country, including New York, Boston, Chicago, and more. The Deal? Unlimited mind-body classes for 6 or 12 weeks. The cost is $680/6 weeks and $975/12 weeks. Physique 57: This bridal challenge focuses on barre based workouts that are blended with cardio, dance, and strength training. Where? 3 different locations in New York City as well as locations throughout the Hamptons and Scarsdale. The Deal? If you can complete 4 classes a week for 4 consecutive weeks, you earn a 15% discount on a 20 class package, which costs $620. FitBrides: An outdoor bootcamp geared to build strength and resistance all while meeting brides in the area. Where? New York City, although the exact location varies each week as all the classes are outside. The Deal? $30 per week for 2 classes or $40 per week for one class for 4-12 weeks. Chasing Nirvana Yoga: Rid nerves and stress with relaxation and meditation at this yoga studio. Where? There are various locations in the Boston area including Boston Proper and Boston Metro West. The Deal? Every package varies depending upon the bride's request, but the bridal packages can include yoga for the planning stage, yoga for the day/week of the wedding, and yoga after the wedding. Prices vary upon each custom package. Bridal Sculpt: A mix of circuit training and bootcamp classes, these classes engage your entire body. Where? 3868 N Lincoln Ave 2nd Floor Dance Center Chicago. The Deal? $80 for 5 consecutive classes, $160 for 10 consecutive classes, or $320 for 20 consecutive classes. Serenity Tree Yoga: Physical health and mental stress relief are both accounted for in Charleston! Brides can relax and engage in core strengthening stretches. Where? On the beach, at your hotel, at your house. As long as the location is near Charleston you are set. The Deal? Varying packages from bridal shower yoga, bachelorette yoga, bride and groom yoga, wedding day yoga, and more. Bridal Fitness Coach: Personal training packages are available to help you reach your fitness goal before your wedding. Where? San Francisco, CA. The Deal? You can choose from a bride only package, a bride and groom package, or a bridal party package. For 8 sessions bride only the cost is $600. For 8 sessions bride and groom the cost is $440 and for 8 sessions bridal party the cost is $344. Maiden Lane Studios: This pilates, barre, and yoga studio offers custom bride and wedding programs that focus on strength training, cardio, stretching, and good nutrition. Where? 80 Maiden Lane San Francisco, CA 94108. The Deal? Pricing varies as you submit a mini request form specifically targeted to your goals! Stay tuned for Part 2 of our "Fitness Friday" series! Are you less likely to show up at a gym or yoga studio and more comfortable in the privacy of your own home? Next week, we'll be exploring bride-specific fitness plans that are accessible online.